Twenty-three percent of the U.S. population relies on onsite wastewater treatment systems, most of which are septic systems. A septic system is a highly efficient, self-contained, underground wastewater treatment system which uses natural processes to treat wastewater, usually in a homeowner’s backyard. According to the EPA, properly sited, constructed and managed onsite wastewater treatment systems are an effective means of protecting human health and the environment. In They also avoid potentially large transfers of water from one watershed to another, that can occur with centralized collection and treatment. 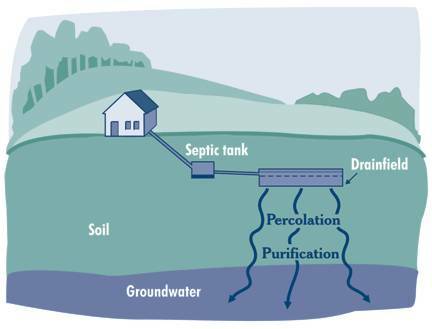 However, inadequately functioning and/or failing septic systems can contribute to the contamination of groundwater, streams and other bodies of water. Wastewater from septic systems may include many types of contaminants, such as nitrates, harmful bacteria, and viruses. Various geologic conditions, such as fractured bedrock and shallow groundwater tables, may allow pollutants, bacteria and viruses to be transported very rapidly and can contaminate nearby drinking water supplies. Do not cover the absorption field with hard surfaces, such as concrete or asphalt. Grass is the best cover, because it will help prevent erosion, and help remove excess water. Do divert surface runoff water from roofs, patios, driveways and other areas away from the absorption field. A septic system consists of two main parts – a septic tank and a drainfield. The septic tank is a watertight box, usually made of concrete or fiberglass, with an inlet and outlet pipe. Wastewater flows from the home to the septic tank through the sewer pipe. The septic tank treats the wastewater naturally by holding it in the tank long enough for solids and liquids to separate. The wastewater forms three layers inside the tank. Solids lighter than water (such as greases and oils) float to the top, forming a layer of scum. Solids heavier than water settle at the bottom of the tank, forming a layer of sludge. This leaves the middle layer of partially clarified wastewater. The layers of sludge and scum remain in the septic tank, where bacteria found naturally in the wastewater work to break the solids down. The sludge and scum that cannot be broken down are retained in the tank until the tank is pumped. The layer of clarified liquid flows from the septic tank to the drainfield. A standard drainfield (also known as a leachfield, disposal field or a soil absorption system) is a series of trenches or a bed lined with gravel or course sand, and buried one to three feet below the ground surface. Perforated pipes or drain tiles run through the trenches to distribute the wastewater. The drainfield treats the wastewater by allowing it to slowly trickle from the pipes out onto the gravel and down through the soil. The gravel and soil act as biological filters. The septic system cleans waste water, which is further purified as it percolates through the soil and helps recharge the groundwater. Click on the image for a brochure in pdf format.